This business is likely to have been a finalist in one or more of the above, but shows commitment and outstanding qualities in many of the categories. We are also the only CRA structure repair centre in the area. Panelbeaters/Refinish Centres that engage in Structural collision repair work by having the required equipment to undertake three dimensional measuring of a vehicle and/or a spray booth oven facility. Attain the required points to complete the ‘Continuing Compulsory Annual Retraining (C-CAR) Programme. Fleet Image was started over 43 years ago in June 1976 as Roy Browne Car painters at 87 Albert Park Drive in Te Awamutu. Thirteen years ago we branched out and started a shop in Hamilton, Now we have 4 Shops (Te Awamutu, Hamilton, Auckland and Hamilton Airport). Roy and Pam Browne formed the business, I Kris Browne & Glenn Tervit have since brought into the business, Roy Browne Car Painters started out with 4 staff members and we now currently have more than 100 staff members including ourselves between the four branches. All Admin is run out of the Te Awamutu Branch which is 1500m2 of workshop and office space in Te Awamutu. We started as painters and now have gone on to full collision repair which we have been doing for the last 10 years. Our Hamilton Branch is set up for minor truck repair and full refinishes which includes a 16 by 5.5m truck booth and bake oven. 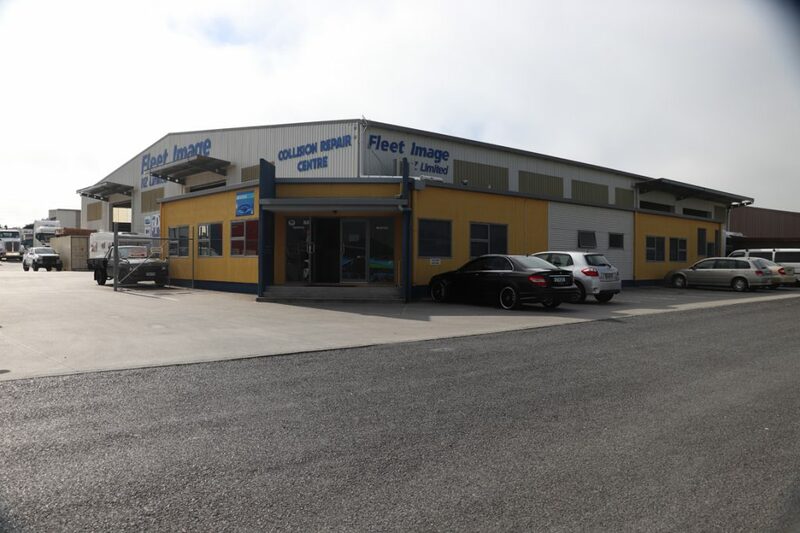 Our Te Awamutu branch is set up for full collision repair services for car’s and minor for trucks as well as a full refinishes service on both. Our Auckland shop is set up for Trucks, Cars, Trailers, Collision repair and full refinishes. Lastly our Hamilton Airport shop is set up for large scale jobs, For example last week we painted a 400T crane, we also paint light aircrafts there as well as helicopters. We also have our own mobile blasting truck which moves in between our branches and other businesses to help us keep better control of our commercial transport refinishing. We have been looking to establish ourselves more in the collision repair side of things and we are approved repairers for FMG, State, NZI, Lumley’s, Vero, AMP and AMI. To do this we have built a big new 1500 m2 premise in Te Awamutu which has been operational since the start of February 07 it has a car and truck booths and bake ovens, prep stations, separate panel area with the latest state of the art computerise Car O Liner chassie straightening machine and measuring system We are also about to launch our approved repairer agreement to give local businesses preferred treatment, faster turnaround and specific courtesy cars for there business, like Vans and Ute as well as cars. We see this as us taking the hassle out of Fleet maintenance for busy businesses. We are the only one stop shop in Te Awamutu and Hamilton but we want to offer a customer service that is second to none. We are putting process in place with computer technology for quoting and digital imaging and using the latest equipment available to our industry that will be able to achieve this.